From left, Caleb and Kyle Greenlee, Clay Montgomery, and Cody Brumfield who attended the Ohio State Urban Soils contest. 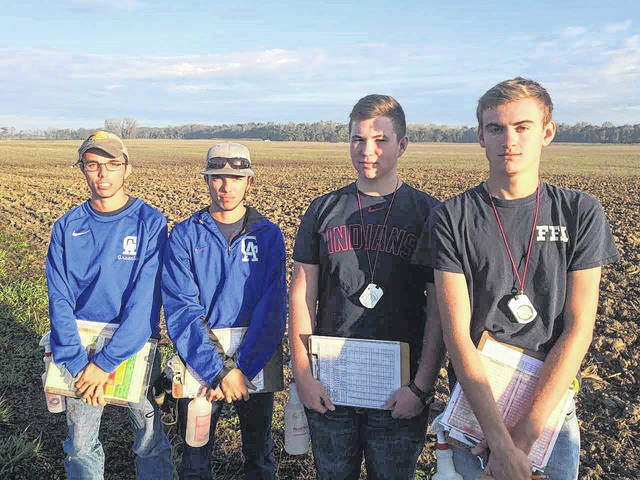 LONDON — Four students from Gallia Academy competed last Saturday at the Ohio State Urban Soils contest, bringing home both team and individual honors. Cody Brumfield, Kyle Greenlee, Clay Montgomery, and Caleb Greenlee brought home top honors as a team in the urban category. Greenlee took first place individually, and Montgomery took fourth. The competition was held at the Farm Science Review in London which presents a very different soil type than what is found in Gallia County. Glaciated soil refers to the kind of soil found in areas that were covered by glaciers at one time. Nearly two thirds of the state has this kind of soil, including London, leaving Gallia students at a disadvantage. “Our biggest challenge was competing in soil that two thirds of the state is familiar with and we’re not,” said Jerrod Ferguson, FFA advisor at GAHS. “We had to stick to the basics to win,” stated Kyle. Focusing on the fundamentals of soil judging was the key to their success, according the all four students. In order to compete at the state level, they had to have success at the district level; placing top five. They won the district competition, earning the right to compete in London. There were fifty teams at the state competition consisting of 165 students. “Historically speaking, this was the highest our school has ever finished in the Urban Soils Division,” said Ferguson. Winning at state qualifies the GAHS team to compete nationally in Oklahoma City in May.